​Since this particular disease seems to be coming up more frequently, I thought I would enlighten y'all on what it is and how it is diagnosed treated. First off, you know your pig better than anyone else, if your pig isn't acting right, you will be the first person that notices. 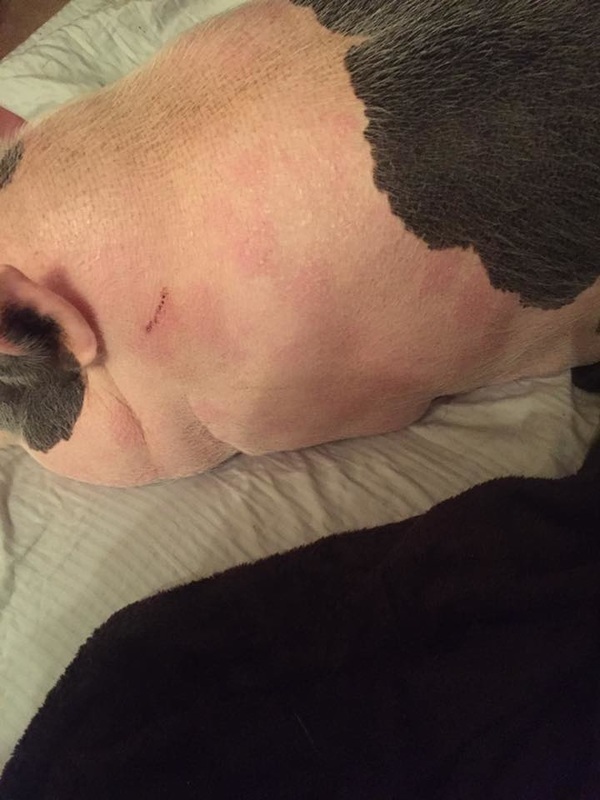 You will notice a change in behavior, maybe your pig usually runs to the door when you walk outside and didn't do it today, you need to check on your pig then. Pigs are routined animals, they know when it's time to get up, they definitely know when it's time to eat and they know when it's bedtime or mama/piggy time, etc. If your pig is acting different, check them over, take a temperature, look in their eyes, ears and mouths, check feet, check hooves and body/skin....once you start making this daily check part of your routine, you will find that you are able to identify issues super early. Now, back to my original topic...erysipelas. Erysipelas is a bacterial infection, caused by a bacteria Erysipelothrix rhusiopathiae. (You will usually not hear it referred to as the scientific name though) people can get erysipelas, (although the human form of what is referred to as erysipelas is actually caused by a streptococcus bacteria, not the same type as pigs get) as well as other animals. There are 23 different strands of this disease and no one vaccination will prevent all 23. (Pigs are susceptible to 15 strains) Vaccinating lessens the chances of your pig contracting the top 3 strains of this illness, but doesn't eliminate it completely. 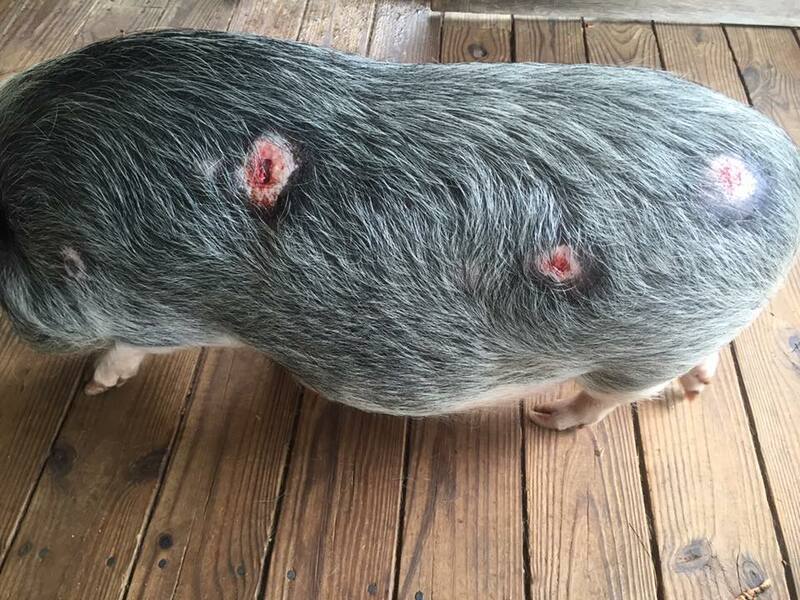 Erysipelas vaccinations are done on a semiannual basis (every 6 months) according to the vaccine manufacturers website and erysipelas is a common disease in untreated mini pigs (found that fact on a USDA publication). Once exposed to the bacteria, symptoms are often found within 48 hours, this includes high fever (105-107), depression, vomiting (not common), lameness, lethargy, discoloration of non pigmented skin, diamond shaped wheals or discoloration of the skin (may or nay not be present) and severe scleral injection (super red eyes) untreated animals usually become comatose and die within 72 hours after onset of symptoms. Treatment is usually procaine penicillin G in early cases, more advanced cases may require IV penicillin and other life sustaining measures like IV fluids, steroids, plasma, oxygen, anti-inflammatory drugs and dopamine to treat hypotension (low blood pressure) and sepsis/bacteremia (infection that has taken over the blood stream causing widespread issues) the organism multiplies once in the body causing the septicemia and the rate at which is multiplies and the level of immunity determines how and when the clinical symptoms will present. Remember, every pig will not present with the same symptoms. 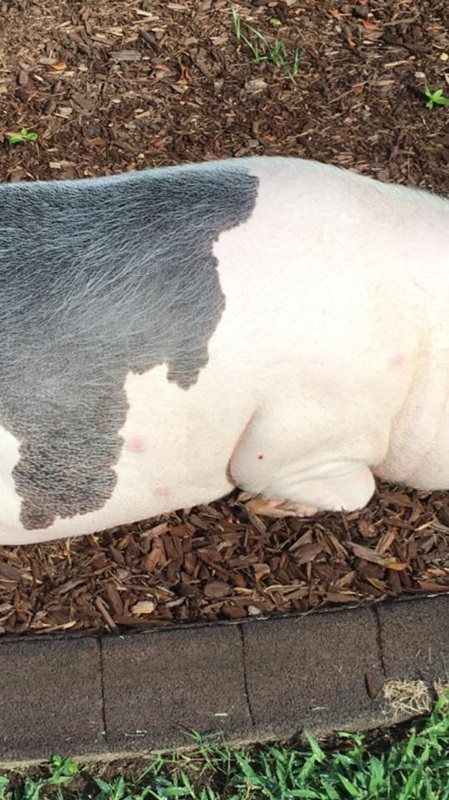 Not every pig will have lesions, some will have lethargy and no appetite, while others may have all the classic signs. The key is early detection and treatment. Erysipelas can live outside of a pig for a few weeks and even longer in light soil. (Thought to be around 35 days at the max, however, other credible websites say as long as 6 months) It can survive in a wide range of temperatures and conditions. Infected feces is likely the main source of infection since its carried on the tonsils and excreted in the feces, urine and salvia. Other ways the organism may find its way into your yard/pasture is contaminated watering systems, wet dirty pens, high populations is pigs with no disinfecting system in place (meaning you don't routinely clean out the pastures or houses so they're constantly tracking in ground clutter, poop, etc) wild birds, other pets, a range of wild animals and new evidence has suggested the biting flies and even ticks can be carriers of this bacteria and help it to spread from animal to animal. Most commonly it is spread by birds and bird droppings. Ingestion of contaminated feed and water usually lead to the bacteria gaining access to the body. No one knows for sure what happens once it enters other than it multiplies rapidly and causes acute symptoms but it's thought that an enzyme may be responsible for all the vascular issues this disease brings to the table. Birds have also been known to contaminate the feed, especially if feed is kept in open storage areas for those who have bigger herds of pigs. If that feed continues to be fed once contaminated, obviously each pig who eats the infected feed has a risk of contracting erysipelas that way. The symptoms were touched on earlier on, but it's a sudden onset, sometimes death is the only symptom, stiffness in the joints or reluctance to rise indicating a possible joint infection (arthritis) and lumps, the lumps can often be felt or palpated in the early stages before anything can be seen. Restricted blood flow causes the small raised areas referred to as "diamonds", they are clearly defined, become red and finally black due to dead tissue, but no abscesses. Most heal within 7-10 days. The diamond shaped lesions (rhomboid skin) aren't always present, but more of an inconsistent feature only with acute cases. If you see these lesions, you know what it most likely is, but again, this illness can be present without the lesions as well. Most will have a fever, usually a high fever (103 and up) There have been pigs that were confirmed to have erysipelas and their lesions didn't look anything like the classic diamond shape. If your pig develops areas of concern that are purple or red and not in a diamond shape, this can still be erysipelas. There are pictures below that are all confirmed to have been erysipelas and not all have "classic" lesions. Not all pigs get lesions either, so you cannot wait if you suspect something is wrong. Waiting can literally cause your pig to die. It doesn't seem to be a seasonal disease, but is it seems to be a greater threat during the warmer months. Presumably, this is because most pigs will begin digging again once the ground thaws and is easier for them to uproot using their snouts. During the warmer months, most pet pigs that are considered "indoor pigs" start spending more time outdoors and when they're outdoors, they are constantly on the hunt for food. The actual organism is a gram + bacillus (if you're a medical nerd like me, you'll appreciate that) and once a pig contracts the virus and it is treated, they are immune to getting that strain again as they will have built up antibodies. But remember, there are acute and chronic forms of this disease and they present differently and the acute forms usually present with classic symptoms, the chronic form is less detectable and may or may not have the acute symptoms present but cause long term damage like the arthritis and heart valve issues. Clean up poop, try to keep your pigs area secure from wild animals and do a daily check. Make it part of your daily routine, check for lumps and bumps, abnormal behavior, eyes, ears and mouth. Check for ticks or unusual skin conditions, check hooves and joints for inflammation or pain. It's a pain to start doing it but eventually your pig will adapt to the routine and enjoy the attention and you will have peace of mind knowing that you will likely identify some of the symptoms for these potentially life threatening diseases early on increasing their survival rate. Vaccinations are available for erysipelas, but since there are 23 strains, the vaccinations do NOT cover all strains, so vaccinations do not always prevent the disease, but typically lessen the severity/chances of the 3 most common strains. Just because your pig has been vaccinated doesn't mean your pig can not contract erysipelas!! Do not disregard the symptoms just because your pig was vaccinated. Penicillin G can save a pigs life if given early on. This is the after effects of erysipelas, the skin sloughs off leaving open wounds.